Engine shipping has become ever more popular as people have began buying and trading auto and mechanical parts online. Not to mention, with the advances in auto technology, specific parts are required for specific makes and models that aren’t always readily available. Thanks to the shipping industry, you can get those parts delivered right to your door. • Aircraft and space propulsion engines. No matter what route you decide to use or the type of engine you’re shipping, it’s important to remember that engines are delicate in nature, and require proper care. They can’t be overly exposed to the elements, and they can be easily damaged by other shipments if they aren’t properly contained. Freight Rate Central takes great care with your engine shipments, but securely and properly packaging and preparing your engine for shipment is always a great idea. • Drain the engine. Be sure to drain all oils or other fluids from the engine to prevent leakage during the shipment. Oil is a lubricant, and if it leaks it can cause your engine to slip loose from any restraints. Leaks can also result in trailer damage charges. • Line your surface. Line your surface with an absorbent material before placing the engine on it. This will help soak up any residual fluids and help cushion your engine. • Place the engine in a crate or on a pallet. Placing your engine in a crate is the safest mode to transport it. Make sure the crate is sturdy enough to hold the engine if it’s lifted into the air by a crane, and that it can withstand the weight of other shipments being stacked on top of it. If you go the pallet route, make sure the pallet is larger than the engine, that way it can provide the best base. After putting your engine in the center of the pallet make sure there are at least four inches of space all around the engine. Securely tie it down. The best tie-downs to use are strong ratcheting straps. • Have a detailed BOL. 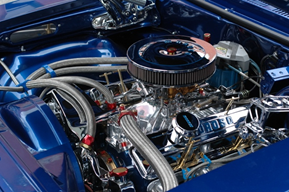 In the description section of your BOL (Bill of Lading) don’t just simply put ‘engine’. Include the type and model as well, as this helps to protect you from re-classing. At Freight Rate Central, we keep all of these details in mind. We know your engine shipment is of great value, and we work to make sure your engine gets to its destination on time, at a great price, and most importantly, safely.